Flash flooding in Carson Valley earlier this month has prompted Douglas County to set an Aug. 6 hearing in Minden, where residents are going to have an opportunity to gather information, provide input and view flood damage maps. “After our staff presentation on the flooding, we wanted to give citizens a place to gather and receive information from as many resources as possible.” said Douglas County Commission Chairman Doug Johnson. The session will be from 3:30-7 p.m. at the CVIC Hall, and will include topics like stormwater management, roads, planning, emergency services, mapping emergency management and public information. Meanwhile, some north Valley residents are asking their neighbors to contact their representatives to reduce off-highway vehicle use on federal land. Resident Mark Garic has been trying to reduce off-highway vehicle use near his neighborhood for many years. Garic said off-road vehicle trails are increasing run-off from public land above Johnson Lane. Skyline Ranch resident Janet Geary said a photo of her fenceline showing rushing water at East Valley Road and Shirley appeared in the newspaper. Geary said she and a group have met several times with the Bureau of Land Management, which has said it would set up signs to encourage people to remain on established trails. Garic has set up a web site discussing the issue at www.douglascountynv.org. For more information about the county’s meeting, call (775) 782-9821 or visitwww.douglascountynv.gov. Northern Carson Valley has experienced flash flooding two summers in a row. Damage in 2014 was estimated at $1 million. A July 20, 2014, thunderstorm over Hot Springs Mountain sent floodwaters into northern Johnson Lane washing away landscaping and replacing it with silt. County officials issued three disaster declarations last year, but the state found none rose to the level of a natural disaster. Heavy monsoon moisture from the south fed thunderstorms earlier this month, with three straight days of heavy rains in the Pine Nuts July 8-10. That flooding washed down Johnson Lane and Buckbrush washes, as well as other drainages, to the neighborhood. At one point on July 8, Johnson Lane and Stephanie Way were closed while waters rushed across them. County commissioners declared a disaster that day, and state officials responded to the neighborhood to collect information about the damage. The county has been cleaning up ditches and culverts in the neighborhood since. Sunday morning 0900 was set for a ride up to Mt. Patterson aka Mars. When I pulled into the staging area I was surprised to see more riders than I expected. I looked around and did not recognize anyone! Turned out to be two groups of riders. PNMTA guys formed up with eight riders and punctually hit the trail at 0900. Heading up the first wash it was apparent how much water this area got from the recent series of thunderstorms. We worked our way up to the summit of Mt. Patterson and were greeted by a new American Flag. It was a beautiful clear day with great views and mild weather. Our group headed off the hill into the trees in search of water. We found it. At a few points I felt like I needed swim trunks. Overall this was a fantastic ride that had a great variety of terrain. 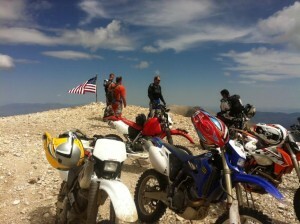 We encountered other riders, cows, utvs, snakes, campers, fisherman, shooters and a few rocks. It was nice seeing others out enjoying our public land. All eight riders made it back to the staging area logging 55 miles just as the thunderstorm started to head our way. This was a great group ride giving us all an opportunity to meet and ride with different folks. Get out and explore, the conditions are great. Jason D.
As riders, BBQers, and film crew (more on that later) met at the Douglas County Fairgrounds parking lot, the day was already a bit windy. A small but very capable delegation of riders were filmed preparing and leaving on their days adventure. The film crew was putting together a promotional video about the “rugged, relaxed and reachable” aspects of the Carson Valley area for the Carson Valley Visitors Authority. 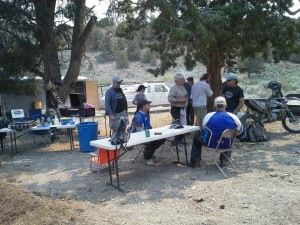 Our BBQ and riders will be one part of the CVVA promo video. After the riders left the staging area, Nate L with Kiwi by his side, a trailer full of BBQ essentials, the film crew behind him and myself taking up the rear, led the way to Sheep Camp, our BBQ destination. Along the way it was quite obvious that the smoke from the Washington Fire (between Markleeville and Ebbitts Pass) was blowing just about to the Sheep Camp area. On arrival we got lucky that Sheep Camp was just on the edge of the large smoke trail. It was there but not thick. Even more fortunately, as the day went on the wind shifted a bit and our air was clear and he sky’s above were blue. The trees offered plenty of shade so the ezups were not needed. And much less wind on that side of the hills. We all pitched in and got the BBQ, tables, etc., set up in no time. The film crew interviewed Nate and myself, discussing PNMTA, the Pine Nut Mountains, and the wonderful attributes of living and playing in the Carson Valley area. Just as my interview was finishing up, as if on que the riders rode into camp. The film crew then mounted a GoPro onto Denny’s handlebars and filmed the riders coming and going on the roads around Sheep Camp. They then filmed numerous creek crossings, which were “mostly” successful. The video cameraman even got splashed a couple of times. And loved it! Thanks Jon. All this hard work created quite a thirst and appetite so a break was welcomed. Apparently the video cameraman was really hungry because he jumped right in at the helm of the grill and went to cooking. Burgers sizzled, gourmet dogs were cooked up, big fat portabello mushrooms with Nate’s secret mix of oil and spices were all sandwiched between toasted buns. Oh Yeah! A few other non-riders showed up for the BBQ. We invited a couple of local teenagers who cruised by on their quads in for burgers. The film crew also got some video of them riding. The chit chat, stories and lies were all as good as the food. After sitting around for a while, all fat, dumb and happy, camp was broken down and we were heading back home around 2-2:30pm. For those of you that couldn’t make it, you missed a good one. The good news is that it probably won’t be the last one. Thanks everyone who showed up. Hope you all had as good a time as I did. This year PNMTA members, Sierra Stompers 4×4 members, Komstock Krawlerz 4×4 members, and other local volunteers filled a 50 yard dumpster with illegally dumped garbage around the Pine Nut Rd. area. Another huge thank you goes out to the Douglas Disposal Inc., for their generous donation of the dumpster. As in the past many years the Sierra Stompers have earned a huge thank you also for the effort they have put to help our cleanups. Thank you also to the Komstock Krawlerz 4×4 Club for cleaning up along the Brunswick Canyon Rd. Thank you Carson Motorsports for the pizza, Costco for drinks, and Jimmy D. with V&C Construction for the portable toilet. All of our members who were able to attend I thank you too. George S. and Kevin T., thanks for running the show this year. Without a lot of helping hands we could never accomplish what we have with these cleanups. And yes it is working, there does seem to be a little less garbage dumped out there each year. 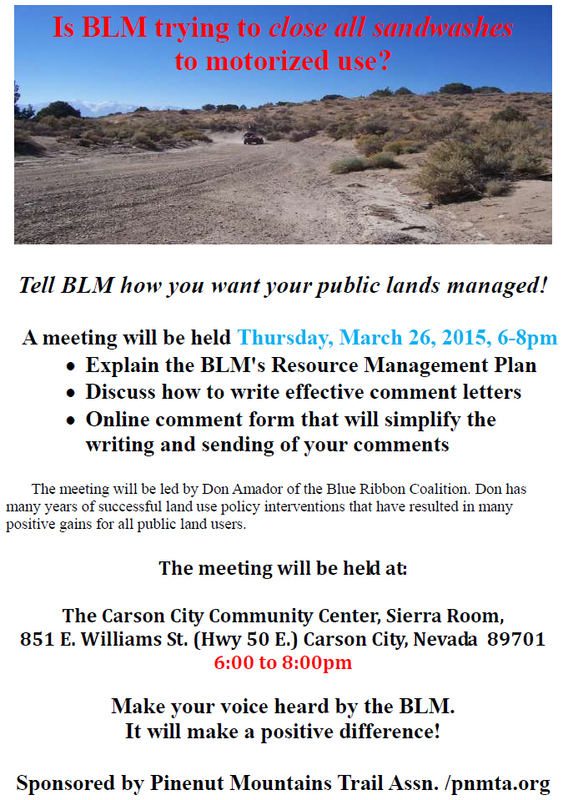 On March 26, 2015, PNMTA and the Blue Ribbon Coalition co-hosted a meeting for OHV users to learn about the Carson City District, BLM, Resource Management Plan revision and to learn how to write substantive comments regarding that plan. 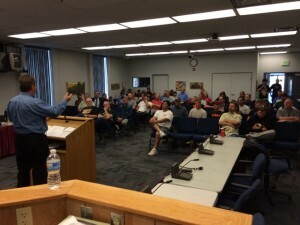 Over 70 concerned people attended. Among the local clubs and groups of note were, The Nevada Trail Stewards, The Sierra Trail Dogs, MRANN, The American Motorcyclists Assoc., and representatives from local Indian Tribes. Many questions got answered and many comments got discussed. PNMTA would like to thank Frank B., and Jim F., from the Sierra Trail Dogs for coming all the way from the Sacramento area and giving a generous donation covering the cost of the meeting. THANK YOU. Video of the meeting can be seen on the Nevada Trail Stewards, Facebook Page. Thank you all who attended the meeting. I hope it was informative for you. Don Amador from Blue Ribbon Coalition leading the discussion and answering questions.